Whether you got to Darwin by plane, train (the Ghan), or my 7 day Road-trip from Adelaide, once you’ve seen the sights – like my TOP TEN things to do in Darwin – you’ll eventually have to leave. But if you’ve got another 7 days (or more!) to kill, the alternative to returning the way you came is to take a road trip – hire a car if you didn’t drive to Darwin – across the Top End through the Kimberley to Broome via the Great Northern Highway! But be warned! Even though the Darwin to Broome road trip CAN be done in a week, you’ll have to carefully pick and choose the sights you want to see or you’ll run out of time. That’s why my 7 day road trip itinerary has optional extras so you can add extra time and extra attractions! So choose what you’d REALLY like to do from the itinerary and enjoy! Driving Time: 6-7 hours. 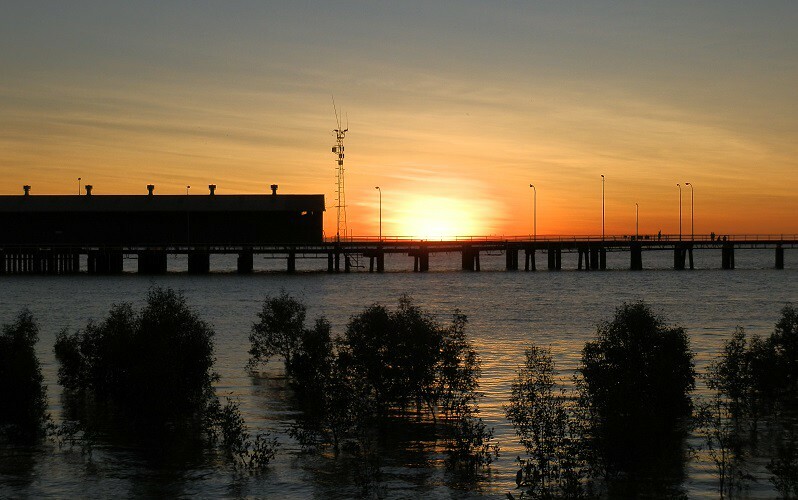 Leave as early as possible – there’s a lot to see and do when you reach the Victoria River Roadhouse! Route & Scenery: Head south from Darwin along the Stuart Highway, passing through tropical bushland and savannah and over low rocky ranges. At Katherine, leave the tropics behind and enter the RED Outback, heading south-west along the Victoria Highway. Near the Roadhouse, the road passes through Judburra/Gregory National Park and Stokes Range. This itinerary assumes you travelled to Darwin via Katherine and have already seen those attractions. For attractions between Darwin and Katherine, see Days 6 and 7 of my Adelaide to Darwin road trip itinerary. From the Victoria River Roadhouse, climb up to the Escarpment Lookout, hike the 1.7 km Joe Creek Loop Walk, take a look at Australia’s WILDEST river (watch for crocodiles! ), watch spectacular sunsets over the Victoria River Escarpment and have a meal at the roadhouse. Take an extra day to explore attractions en route to Katherine. 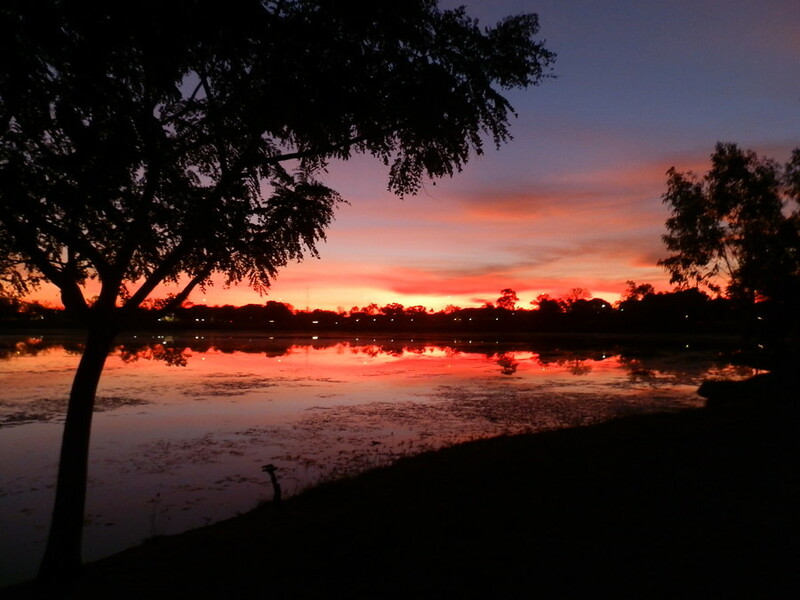 Stay overnight in Katherine on Day 1 and travel to Victoria River Roadhouse on Day 2. Route & Scenery: Head west from Victoria River Roadhouse climbing the Victoria River Escarpment and passing through the Stokes Range. Spectacular outback scenery complete with Boab trees all the way! Today’s short trip means there’s time to see any attractions around Victoria River you didn’t have time for yesterday. 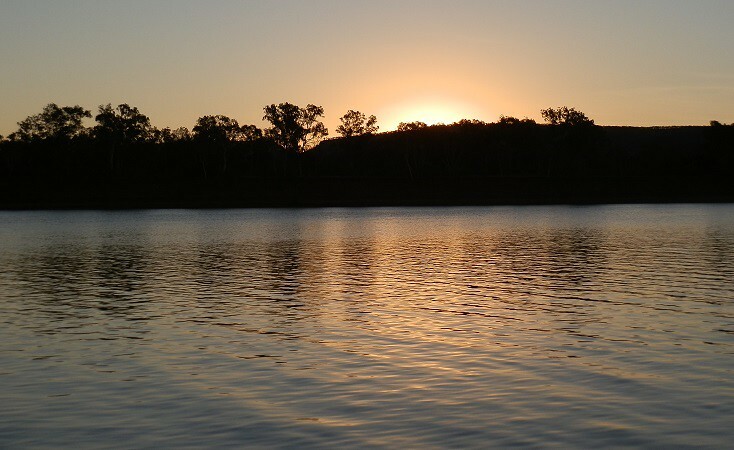 In Timber Creek, book a sunset Victoria River Cruise to see more of Timber Creek, discover Australia’s wildest river, see more crocodiles than you’ve probably ever seen before, and enjoy drinks and snacks while watching the sunset. Stay an extra night and explore Timber Creek. There’s the historic museum, Escarpment Lookout, crocodile feeding in the creek behind the caravan parks and more of Gregory National Park. Driving Time: 3 hours (including extra for a WA/NT Border vehicle check – don’t carry fruit, vegetables, plants or flowers). Gain bonus extra time at the border by turning clocks back to WA time! Route & Scenery: Drive west along the Victoria Highway passing through spectacular ranges and land formations. After the border checkpoint, approx 150 km from Timber Creek, continue to Kununurra. Keep River National Park, sometimes referred to as the Mini Bungle-Bungles, is just 3 km from the WA border. Lake Argyle, Australia’s largest body of fresh water, is 34 km off the highway just across the border. 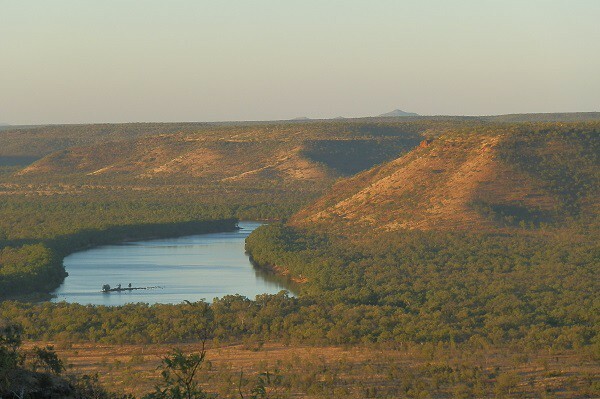 Route & Scenery: 46 km west of Kununurra, turn east onto the Great Northern Highway. 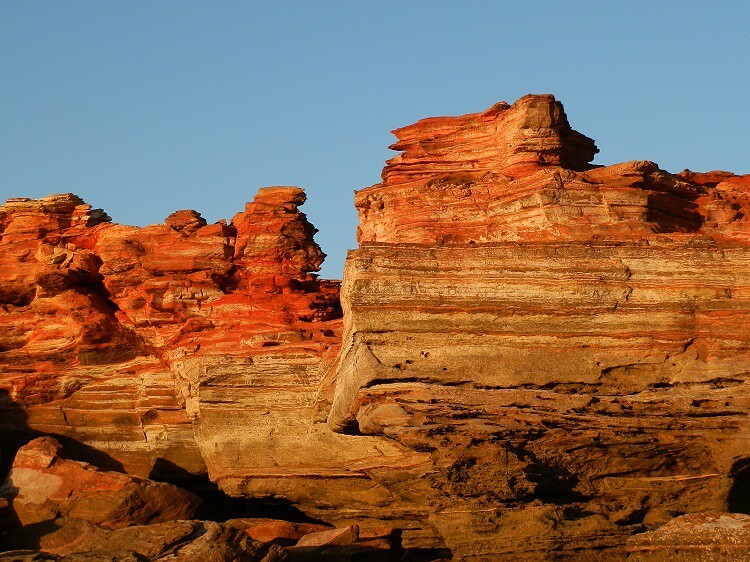 Spectacular scenery with multi-coloured rock formations through the Carr-Boyd and O’Connell Ranges. Outback scenery with red rock and spinifex closer to Halls Creek. 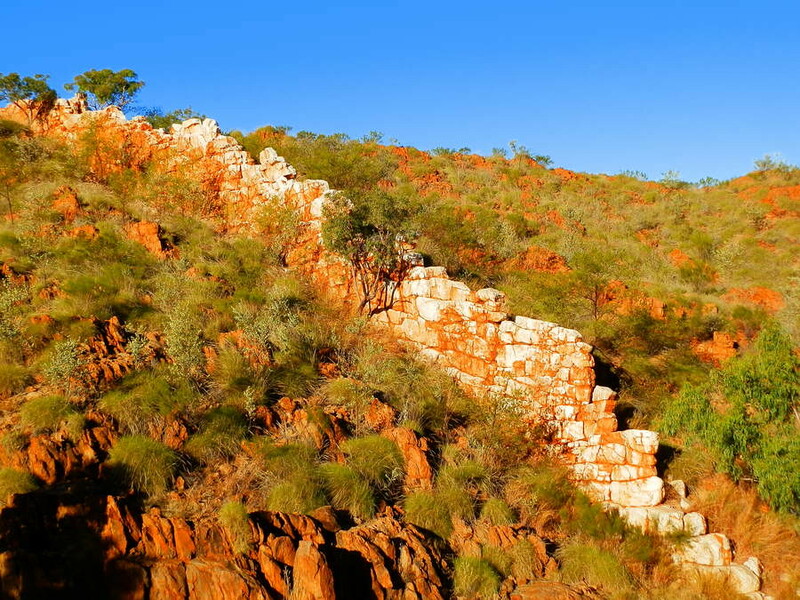 At Halls Creek, visit the China Wall quartz formation, Caroline Pool and Old Halls Creek. Route & Scenery: Travel south-west from Halls Creek passing through oddly shaped rocky mountains, cliffs and canyons then lightly wooded pastoral country. 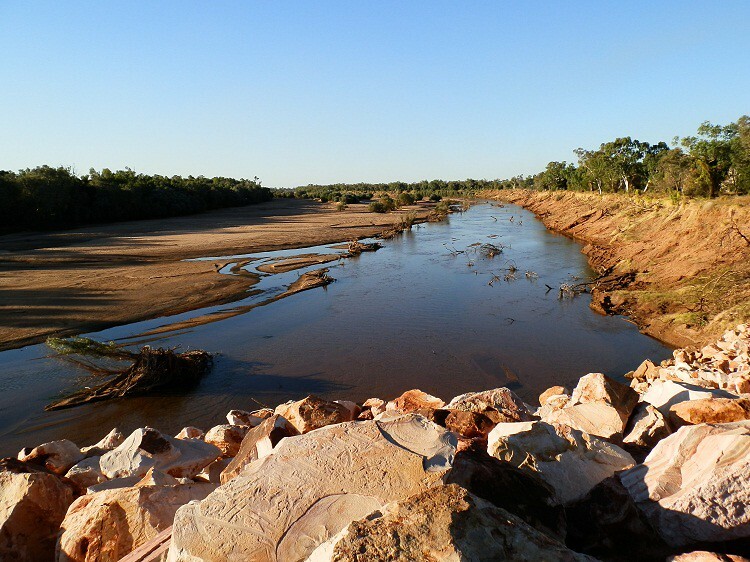 When in flood, the Fitzroy River has the largest water volume of any river in Australia; and in the world only the Amazon is larger! Take a look – even if it’s NOT in flood! 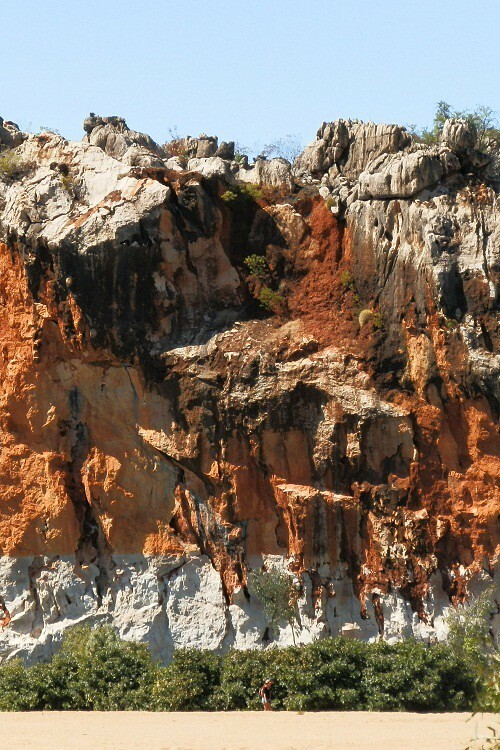 Take a cruise through Geikie Gorge, a Devonian reef system about 20 km from Fitzroy Crossing. 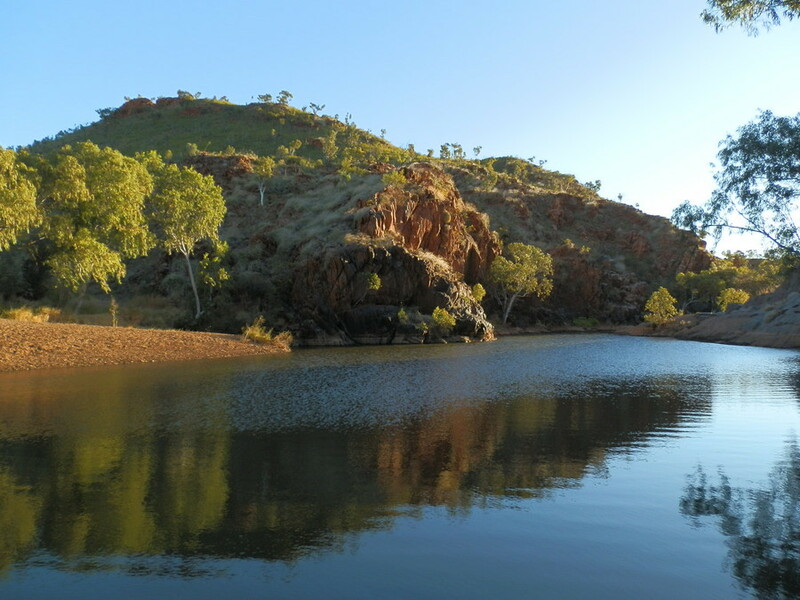 Stay an extra day and explore Geikie Gorge via several walks, or take a tour to Tunnel Creek and Windjana Gorge. 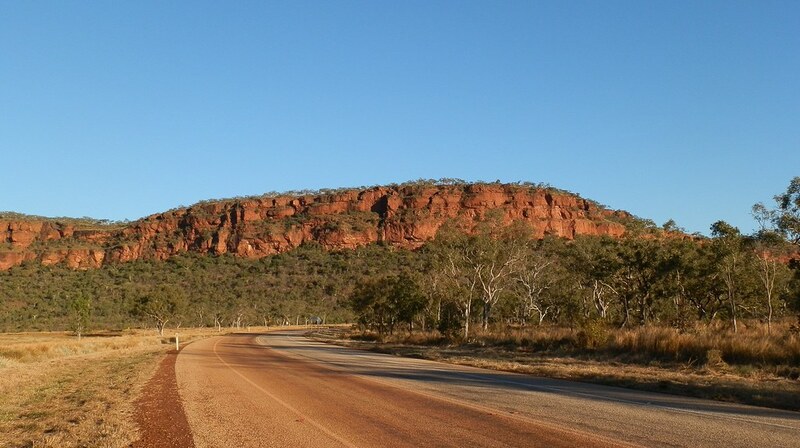 Route & Scenery: Head west along the Great Northern Highway and head north at the junction with the Broome-Derby road. It’s then only 40 km to Derby on King Sound. 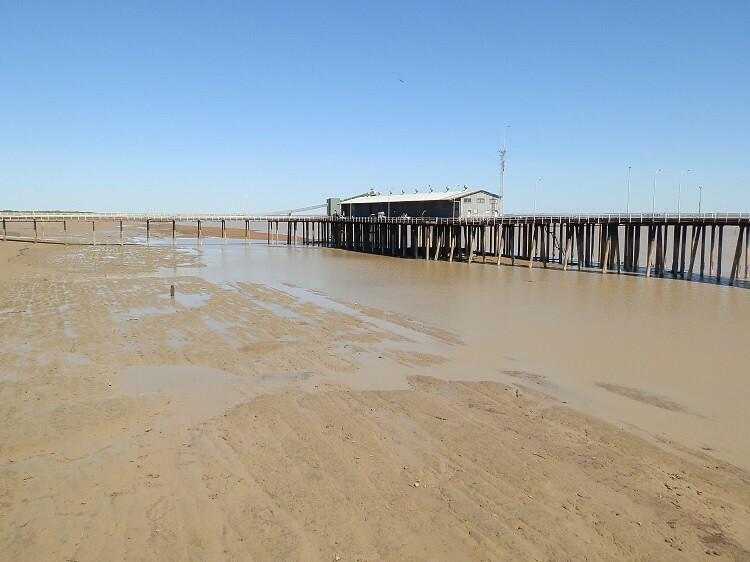 Watch the ebb and flow of the highest tides in Australia from the Derby Jetty, 12 metres above the low tide line. 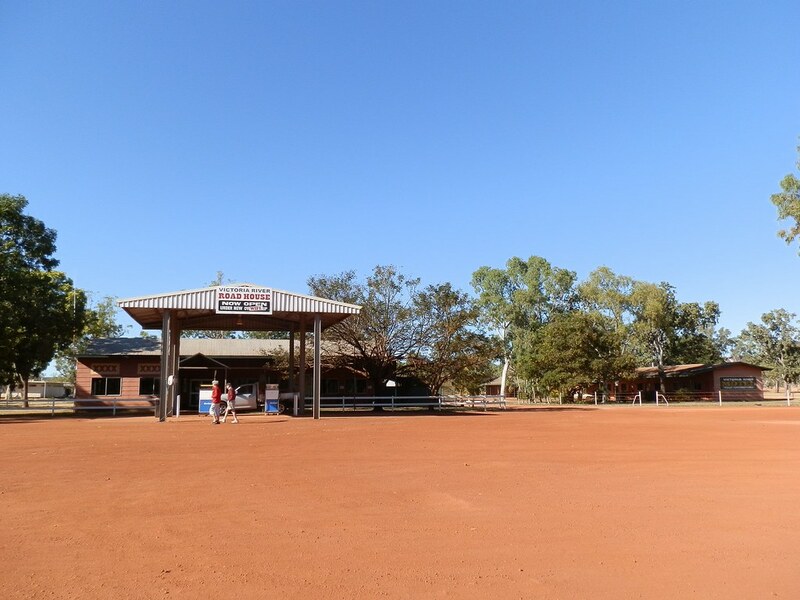 Other Derby attractions include the Jandamarra Heritage Trail, old prison, Boab Prison Tree, Frosty’s Pool, the Long Trough and the Joonjoo Botanic Walk. Read MORE: The Highest Tide in OZ! 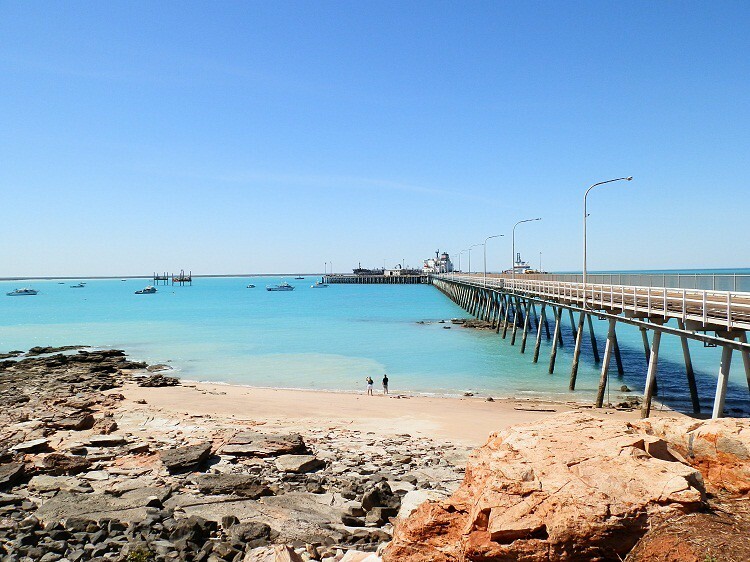 Route & Scenery: Follow the Great Northern Highway south-west to Broome. 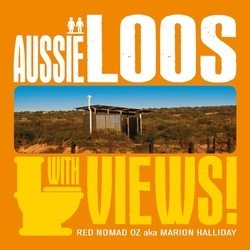 Sun Pictures and the Scenic Public Loo! Broome’s many attractions probably mean you’ll want to stay for a LOT longer than just one night! And why not? You deserve a break after an epic road trip like this! And anyway, you may as well kick back and enjoy yourself while you work out where to go next! PS For the record, it took me 28 nights to do the Darwin to Broome Road Trip; and I spent 15 more nights exploring Broome and surrounds! And I STILL didn’t see everything! So yes, it CAN be done in 7 days – but if you’ve got the time, you’ll see a LOT more! I’ve only ever been there in winter which is the dry season, Michael – but the locals tell me it’s hot, humid and sometimes stormy in Feb because it’s the wet season. The average maximum temperature is mid 30’s, and minimum is mid-high 20’s. But the good news is you shouldn’t have any trouble booking somewhere to stay 😀 If you’re driving, it’ll be a long, hot trip – a lot of tour operators close down over the summer so if you’re thinking about sightseeing, it’s best to check directly with any tour operators beforehand. 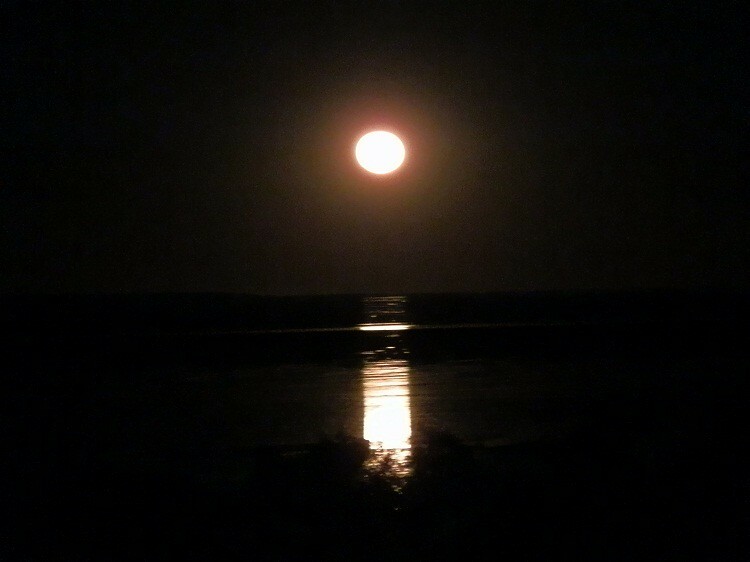 You may find this website helpful: https://www.kimberleyaustralia.com/broome-weather.html – I hope you enjoy your trip! It’s such an awesome road trip, isn’t it Laura? I recommend it to everyone 😀 And I also recommend to take a LOT more time than 7 days – yes, it CAN be done in 7 days, but it’s so much better to take your time (if possible) and really explore! Hope to do it again myself one day – maybe we’ll meet on the road!! Thanks for all the info posted on your site. We are flying into Adelaide in June 2018 and with an exchange motorhome ( the Aussies will be in the U.K. Touring in our motorhome) we intend the Adelaide to Darwin route then on through the Kimberly , down to Perth and back to Adelaide largely following your recommendations. Hopefully, it will all be achieved in 3 months without belting around everywhere. Here’s looking forward to visiting your magnificent country again. Nice one! We’re actually hoping to at some stage drive our own car up to Darwin, from Tassie so it’ll be a loooooong trip, though hadn’t considered tacking on Darwin – Broome – the outback scenery looks incredible, especially sunset at Gantheaume Point once you actually arrive in Broome. Thanks! It’s a long drive, Meg, but it’s a GREAT drive! You might also be interested in my 7 day guide from Adelaide to Darwin – although my real tip is to take WAY more than 7 days if you want to see everything! Hi my husband and i are thinking of doing this next June 2018 leaving Warrnambool and heading up the centre and across to broome home down west cosst to Perth and across the Nulla home looking at 7-8 weeks to do it . The more time you take the better it’ll be, Anne-Maree – it CAN be done in 7 days, but this leg of the journey (ie Darwin to Broome) actually took us a month!! I just know some people are pressed for time, so I’ve put the shortest times in, but if you CAN take the extra time, you’ll see a lot more 😀 Enjoy!! Thanks for the day by day itinerary. I love road trips like these. Where you can travel slow, stopping at destinations midway and then continuing your journey. I will save this one for future reference. I agree – an itinerary is a good way to plan your trip, but I always leave room for the unexpected! We’ve found some great places by deviating from our plan – sometimes, anyway! Now I’m not sure if I’ll ever do Australia ‘properly’. By that I mean these places – not the cities. I might have to be dragged across the customs line before I’d leave! It takes YEARS to do Australia ‘properly’, Nuraini – especially if you want to see all the hidden secrets and destinations off the tourist trail. But you have to start somewhere!! Just don’t break any laws to do it, haha! Just found this site. Very informative. I’m driving /camping from Melb to Katherine at the end of July with stopovers in Coober Pedy, Alice Springs and Tenant Creek. Then head west to Broome. Drove to Alice Springs / Kings Canyon and Uluru May 2016 and absolutely loved the outback. Hence me going back. I’ve also found that once you’ve been to the Outback, you won’t be able to stay away, Peter! 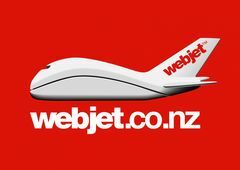 Sounds like your next trip will be fantastic – I hope you like that part of OZ as much as I did! what a lovely and informative post, red! beautiful photos too. thank you for this fantastic pictorial tour! It’s an awesome road-trip, Betty! It’s a pleasure to share it, because writing the post was ALMOST as good as re-living the whole trip! Have a great weekend too, my friend! Beautiful photos; fantastic post! Thank you so much for sharing this lovely tour! It’s my pleasure, Linda! I hope you get to do it yourself one day! Have a great weekend! What an amazing adventure. Fantastic pictures. Thank you Imagebloke – maybe it’s an amazing adventure BECAUSE of the photos!! Hope you get to see it for yourself one day! It must be fun to be young again and be able to drive yourself. Being older I prefer someone else to do the driving on long trips. We did this trip but in reverse and in a 4 wheel drive small bus. There are many wondrous things to see in that part of our country. The amazing natural attractions of this part of OZ would be just as awesome from a tour bus, Diane!! It IS a long way … which is probably why it took us a month, not just 7 days!! I guess that’s the bonus of driving yourself AND having the luxury of time! I KNOW I’m lucky! We did this road-trip towing our camper trailer, Linda – but I’ve just done a quick google of ‘Tour Company Darwin to Broome’ and there are a LOT of providers! Try it and see if there’s anything suitable – I can’t recommend one in particular, because they all have different levels of activity, age groups, accommodation and price tags and I’m not sure which would suit you best. Alternatively, all the places we stayed at also had motel or cabin type accommodation, so you could self-drive. Let me know if I can help you further! Marion, thank you for sharing this awesome road trip and your wonderful photos! I have been to Darwin and I have been to Katherine but I have not been on this road trip but I definitely want to go one day – and I think I will definitely need to plan to have more than 7 days! Road trips are not familiar to me at all because I’ve heard of no story about them in my country. 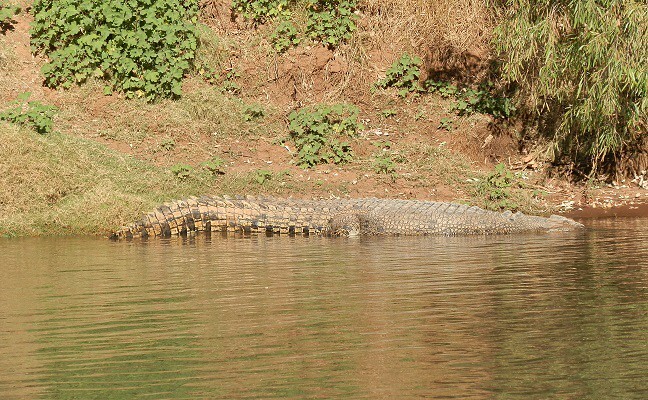 So this post is a tale in a distant world for me, but if I manage to imagine it, I want to meet as many crocodiles as possible!! Probably to get the full effect and enjoyment of such a trip, you would have to make the drive in seven weeks, not seven days. I love the first picture, I want to walk and sit on those rocks; Fitzroy Crossing rocks too. Am I glad we got some points of your list, travelling the other way round. Since time-travel sadly is no option I have to say I really can´t wait to retire and become a Grey Nomad! Gosh, am I “home-sick” right now! You can’t expect to do everything in one trip, Iris!! We missed out on Purnululu, the Gibb River Road (other than a tour), the Horizontal waterfall, Wolfe Crater and a lot of other things besides because there just wasn’t enough time! But hey!! Why don’t we meet on the road somewhere down here when you ARE retired?!?! Lovely photos and good to see the distances. We are going there very soon. At PA at the moment..our 3 rd time. Oh gosh, what can I say? I so, so want to do that trip one day. Your love of the land shines through in your photos. It’s one of the most spectacular road-trips in OZ, Pauline! Do I love it? Hell, yeah!! Hope you get to do it one day!! Start planning NOW, Jo-Anne – it’s SO worth doing! Take longer than 7 days if you can because there’s a LOT to see and do!! Have a great week! Thanks for bringing back such wonderful memories of our trip across the Kimberly and into Katherine, NT. I loved this drive as it wound through some of the most spectacular territory. One day we are going back to the Kimberley to drive the Gibb River Road. I was bedazzled by the awesome Outback scenery on this trip – wasn’t sure what to expect, but it surpassed any thoughts I might have had! We took a foray onto the Gibb River Rd via a tour – we’d probably have to replace nearly EVERYTHING on our rig to drive it ourselves, but would LOVE to do it! !